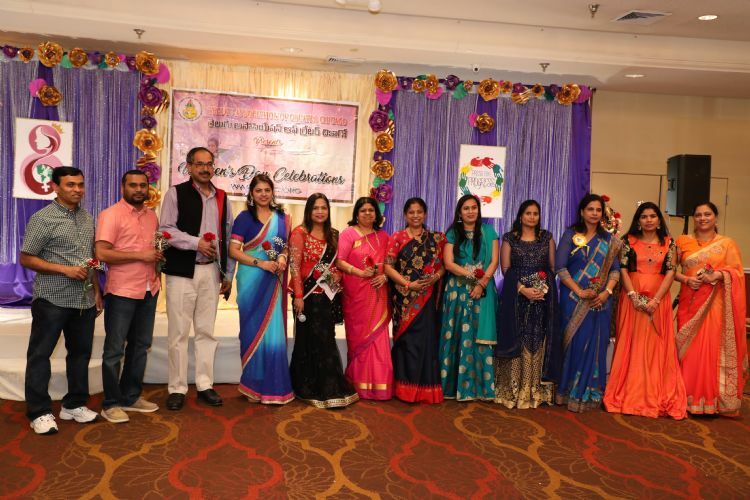 Chicago: Telugu Association of Greater Chicago celebrated International Women's day event this year on March 11th 2018 at Ramada Inn Banquets, Glendale, IL. The program was started by Prayer to Lord Ganesh and lighting Diya by chief guest Chicago Indian Consulate General of India office Consul Mrs. Rajeswari Chandrasekaran along with Co-Sponsor American Telangana Association representatives Mrs Jyothi Madhavaram and Mrs Pranitha Kandimalla. Mrs Bindhu Gongati TAGC Women's Forum chair Opened the forum with her speech and TAGC President Mrs.Jyothi Chintalapani addressed the attendees with welcome speech. About 450 Women participated to celebrate TAGC Women's day event from all over Chicago land Area. This event was successful with an Overwhelming response from the participants. TAGC Women's day chair Bindhu Gongati along with co-chairs Nandini Kondapalli, Keerthi Addula , Sailaja Yendluri and members Meghana Lakkadi Saumya Bojja, Rajitha Gopu, Deepti Garlapati, Deepthi Muthyampet, Kranthi Donda, Swetha Janamanchi, Haritha Gunuganti planned severals fun filled activities and executed to create joyful atmosphere. Musical Entertainment by Shailaja Merugu, Valuable information was shared by guest speakers Mamata Sharma and Greeshma Varghese, Shanthigram Ayurvedic wellness center. A tribute to Sreedevi has been presented by Prasanna Kandukuri and Ramya Reddy. Youth Volunteers Sunaina Gongati, Riya Gunuganti, Sanjana Gongati, Riva Lakkadi, Smrithi Berram, Lahari Berram, Ameya and Tanvi Sirivol helped in selling Raffle tickets and raised funds to donate to La Rabida Children's hospital, Chicago. TAGC Board of Directors Mamatha Lankala, Vijay Beeram, Venkat Gunuganti, Swetha Janamanchi received the crowd and make them comfortable with registrations and seating arrangements and presented member exclusive gifts to all members. Vani Yentrintala overseen the nice decorations made by the team. President thanked co-sponsor American Telangana Association led by President Satya Kandimalla and Chairman Karunakar Madhavaram and all other sponsors. She also thanked all the Board members and Volunteers present including Uma Avadutha, Sujatha Katta and volunteers Manasa Lattupalli, Kranthi Beeram, Rukmini chada. All attendees enjoyed playing games and winning several gifts, member exclusive gifts, gold and silver coins by Regal Jewels. Delicious food with different varieties was provided by Priya Indian Restaurant, Schaumburg and the event was thoroughly enjoyed by all attendees by closing with dance floor open with DJ music.